A Prelude (German. Präludium; Lat. Praeludium; Fr. Prélude; It. Preludio) is a short piece of music and the form of which may vary from piece to piece. The prelude may be thought of as a preface. During the Baroque era it may have served as an introduction to succeeding movements of a work that were usually longer and more complex. It generally features a small number of rhythmic and melodic motifs that recur through the piece. Stylistically, the prelude is improvisatory in nature. They were often freely composed in an extemporary style for the lute and other Renaissance string instruments and were originally used for warming up the fingers and checking the instrument's tuning and sound quality. In a piece by Joan Ambrosio Dalza published in 1508 it is written under the heading; “Tastar de corde” in Italian, literally, “testing of the strings”. This item/download includes 3 versions! 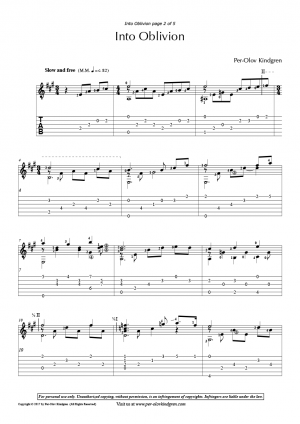 Standard 6-stringed guitar notation, standard guitar TABs and a version for 11-stringed guitar. (Altguitar) Please try to save the nature and only print the pages you need! Play this piece as an “improvisation”! Elaborate! Feel free! Have fun!